Websand started from 15+ years in customer loyalty marketing, so it’s a huge part of what we do, even if we don’t issue points. We’ve used this experience to develop Websand as an easy to use marketing automation platform. A marketing platform that helps marketers to get closer to their customers and create customer loyalty marketing campaigns based on the customer information their business already holds. 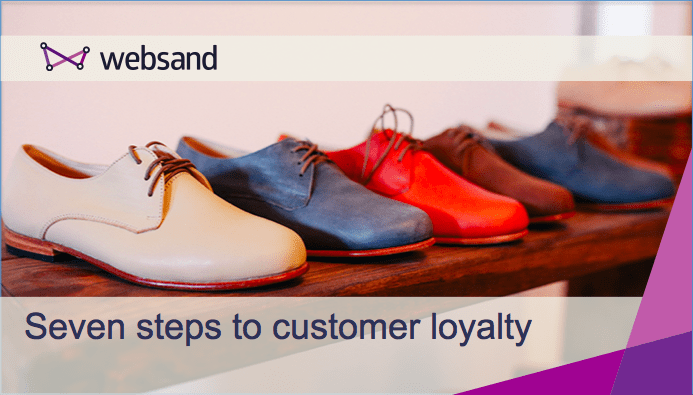 Based on our experience, we’ve pulled together a listing of seven steps you can follow to help you put your customer loyalty marketing plan in place, get closer to your customers and generate some good old fashioned customer loyalty. 1. Recognise that customers are people. People buy from people, so it’s only natural you’re your customers want to feel that you care about them. The problem is everyone is different. So how can you build a relationship with them and apply this consistently across 1000’s of people? Start by making sure your marketing recognises customers as real people – that can be as simple as using their name, so not Sir/Madam but Dear John. Next, make things relevant by sending messages that are related to their behaviour. The objective is simple – make them feel appreciated. Start with a welcome message (these always get opened). This type of message adds a WOW factor to your marketing. The message is clearly about them, and adds value. When Amelia visits you can be pretty sure that desert will taste even better. 2. Give your best customers VIP access. Your best customers – those that generate the majority of your revenue – are special, so treat them that way. Let your best customers in first. Allow them early access to sales. Even create flash sales just for them. 3. Invite them behind the scenes. Give your customers the opportunity to meet the makers of your products or services. Granted, this isn’t appropriate for everyone, but when it is appropriate it really works. One of customers, The Lakes Distillery gives its founders club members a free distillery tour, which includes a meeting with the head brewer and the Whisky barrel that’s being distilled – just for them. Other ideas you could use include – the chef visiting your table during a meal or the owner of the business calling you up and personally thanking you for your custom. Whatever you decide to adopt, please make the offering or gesture if fits with the personality of your business. The more natural it is, the better it will be received by your customers and the easier it will be for your business to deliver (people often forget about that bit). 4. Make it easy for your customers to share how great you are. Make it easy for your customers to sell your products or services to their friends, and reward them for it. So when Amelia visits you can be pretty sure that dessert will taste pretty good AND she’ll bring some friends. But that’s only one example. Other examples include win-win referral programmes and the usual 10% off for my friend = 10% off for me. Sky have been doing this for years with M&S vouchers as the bait. But increasingly it’s also about giving customers the ability to personalise or even create their own discount / offers for their friends. Getting this right creates all round value. The customer has increased social status by giving special deals to their friends. Their friends already trust the offer as it’s also an endorsement of your business and appreciate the offer. Your business gets new customers that have been personally selected by someone that already loves what you do. And that is the best kind of new customer you can get. 5. Remember, it’s about the people. The customer is king, so make you need to offer a great service to everyone, but not everyone is a VIP. The 80/20 rule applies in the majority of cases. That means that the majority of your revenue is likely to come from a minority of your customers. Using customer segmentation and putting in place metrics such as customer lifetime value will allow you to easily identify the most valuable customers to your business. Once you’ve identified them, you can then create special benefits and offers based around the on recency, frequency as well as spend from your customers. This marketing strategy creates a system that nurtures and rewards all customers based on their unique and individual behaviour. It adds to the overall customer experience, re-enforces customer engagement and helps those with the potential to become VIP get there a little faster. 6. Make sure every little thing you do is magic. Offering benefits, special deals and rewards can get expensive. So it’s always a great idea to measure the value that is being created from every little thing you offer. Set ‘magic markers’ of value for each little offering you include as part of your marketing programme and then review the results on a regular basis. If it works, keep it working. If it doesn’t work, then fix it or scrap it. 7. Creating customer loyalty is an experience powered by technology. Creating points doesn’t create loyalty. It’s much deeper than that. If your service or product offering doesn’t add value, then creating loyalty will be practically impossible. Implementing loyalty marketing strategies does require technology, such as Websand, but the technology doesn’t create customer loyalty, as a clever marketer that’s your job. Technology is a mechanism to make it easier for you to apply your marketing plans. To create some marketing magic that will create, nurture and reward loyalty from your customers. If your customers aren’t getting a good experience, then it’s unlikely that VIP benefits will make any difference. Focus on making sure your customers love what you do. So add some extra magic to show them you really care and your business will skyrocket. Websand is built on 15+ years of experience in loyalty marketing and data driven marketing. If you are looking to create loyalty marketing within your business, we can help, so get in touch.